Diwali is about to prevail and e-commerce giants such as Flipkart, Amazon, and Snapdeal have already begun their festive sales. Xiaomi has also joined the race and comes up with three- day shopping carnival, starting from 14th October to 17th October. Celebrate this ‘Diwali with Mi and avail exciting offers on Xiaomi products, ranging from smartphones to accessories. 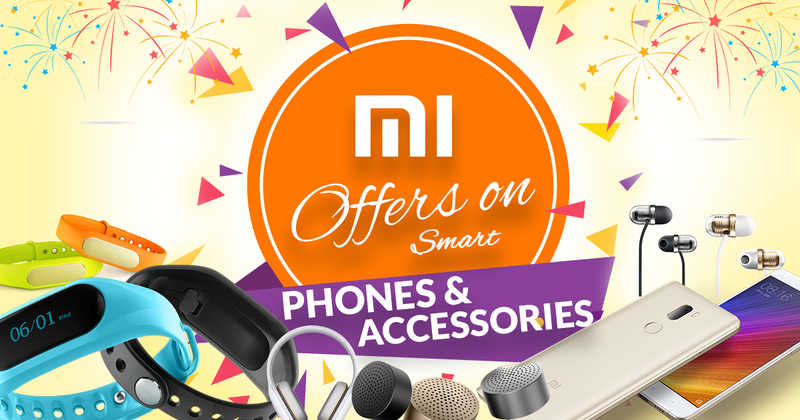 Likewise, Flipkart and Amazon, Xiaomi also providing various exciting discounts and offers on Xiaomi products including smartphones, accessories, power banks, headphones, speakers, air purifier and earphones. Chinese electronics manufacturer, Xiaomi included all of its smartphones in its Diwali Festival sale, recently launched Mi Mix 2, priced at Rs 35,999 is available in black color variant at No Cost EMI. Mi Mix 2 sports a 15.2cm (5.99) display along with 18: 9 aspect ratio. It also comes up with four-sided curved ceramic body global bands, 43 bands along with 6 network modes. It is powered by 835 Snapdragon coupled with 6GB RAM and 128GB internal storage. Redmi Note 4 both variants, 3GB+32GB and 4GB+64GB will be available at a price of Rs 9,999 and 10,999 respectively during the festive sale, against Rs 10,999 and Rs 12,999 respectively. It is available in black, gold and grey color variants. Redmi Note 4 lake blue color variant has reduced the reduced the prices from Rs 12,999 to Rs 10,999 for the 64GB model along with 4GB of RAM. Recently launched Mi A1 is available for purchase at Rs 14,999 in the black and gold variant, as such no offer is available in during Diwali sale. It featuring a dual rear camera, 2x optical zoom and sporting a 13.5cm (5.5) HD display. Xiaomi is providing a discount of up to Rs 1,500 on Redmi 4. Redmi 4, 2GB RAM variant along with 16GB is priced at Rs 6,999, 3GB RAM variant along with 32GB is available at Rs 8,999, 4GB RAM variant along with 64GB is available for purchase Rs 10,999 during the Diwali Sale. Mi is also offering a flat discount of up to Rs 2000 on Mi Max 2 for 32GB and 64GB variant, it is available for purchase at Rs12,999 and Rs 14,999 respectively. Redmi 4A both variants,16GB and 32GB priced at Rs 5,999 and Rs 6,999 respectively which is currently out of stock. Mi Band HRX Edition is available for purchase at Rs 1,299 during the Diwali sale. Xiaomi is offering a flat discount of Rs 300 on Mi Headphones Comfort White, priced at Rs 2,699 at Rs 2,999. The company has reduced the prices of Mi In-Ear Headphones Basic Matte from Rs 599 to Rs 499. Recently launched Mi Bluetooth Speaker Basic 2 is available for purchase Rs 1,799.